Q. What kind of warranty do your mobile home roofs come with? A. Our most widely used product of 45 mil comes with a lifetime warranty from our company. While an upgrade to 60 mil TPO one would get a warranty from the manufacture of the TPO as well as a life time warranty from All Weather Roofing, Inc.
Q. What is the average cost of a mobile home roofover provided by your company? A. It depends on the size of the roof we are looking at to be covered. Our mobile home roof over pricing is based on square feet of the project and what type of membrane you would like to be installed on your home. With the 45 mil being the lower priced per square foot, and then 60 mil and the shingle pattern come with a price upgrade per square foot. Q. How long does it take to install All Weather Roofing to install a roof? A. Most of our installations take one day to be installed. As for our commercial jobs that may take up to 2 to 3 days to install. Q. Where are you located? And what areas do you cover? A. Our main headquarters is located just south of Tampa in Bradenton, Florida. We cover all counties on the west coast of Florida from Hernando County all the way down to Collier County. We go out to Polk, Highland, and Desoto Counties in the east. Q. Does All Weather Roofing use subcontractors? A. We never use subcontractors. All of the employees for All Weather Roofing work for us and answer to the owners of the company. A. We are Florida state certified contractor and carry all insurance necessary to work in the state of Florida. Q. Does All Weather Roofing install fascia and gutters? A. Yes we install both of these and your sales rep will go over the options that may apply to your installation. The sales rep will also determine what needs to be replaced and most affordable for your roofing needs. Q. What sets you apart from your competition? A. We are family owned and operated for over 30 years and just recently the owners son passed his roofing license test in the state of Florida, so you can count on us to be around for a long time to come. As any family runned business we are focused on making your transactions with All Weather Roofing as smooth as possible. Each customer is treated as family. We are creating customers for life. All Weather Roofing goes above and beyond your expectations. We would not be the most recommended roofing company for mobile homes if we provided subpar results. Q. 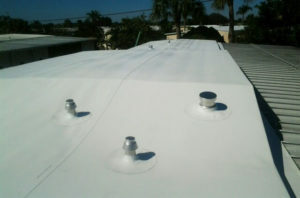 Is there any maintenance that needs to be done on the roofs that All Weather Roofing install? A. No, unlike metal roofs, our single ply membrane roofs do not rely on caulking, coatings and tacky tapes or adhesives to keep your home water tight. Q. How much can I expect to save in A/C bills from an All Weather Roofing roof? A. The usual savings can be anywhere from 20 to 30% and maybe more. It all depends on what type of roof you have now, and if you have any insulation currently in your home. Q. What is the roof rated for wind uplift? A. All of the roofs that All Weather Roofing install are Miami-Dade county approved with a minimum wind uplift rating of 145mph. Q. Are you rated on with the Better Business Bureau? A. Yes and we carry an A+ rating with the BBB. Q. Does All Weather Roofing do financing? A. Yes, we are an approved company that works with Wells Fargo to provide financing. There are many payment options to choose from for your budget. Need a mobile home roofing estimate? If you would like to find out more about your roofing options be sure to contact us. You can fill out our free online form or give us a call at 800-297-3758. We are available 24-hours a day so that we can answer your questions and help you make the right decision for your roofing project.